Since everyone works or goes to school on Mondays & Wednesdays, it is necessary that I make lunches the night before. However, after a busy Tuesday, culminating with softball practice for me & Shaun, I still had lunches to make. Ben decided to be helpful and demand the last corndog muffin. I wanted something different, but realized that by giving in, it was less work for me! 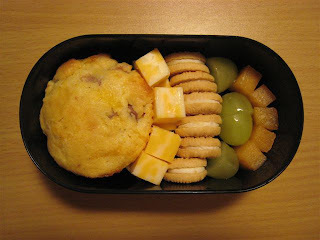 So Ben has the last corndog muffin, cheese cubes, mini vanilla oreos (that he begged for at SuperTarget), grapes and canteloupe. The container is tiny but it is part of a Mickey Mouse set that he loves and has asked me daily to use. I'm also adding on (no picture), some vanilla yogurt with blueberries in a separate container for him.